Greetings and welcome to my web site. I have created this site for the primary purpose of presenting my family tree (the Collymore side) for genealogical purposes. For those of you who ARE Collymores, whether known or unknown to me, this may be a good starting point for you to find potential family links and where your branch of the family may fit in. I encourage you all to talk with your elders while they are still alive, and find out about your family's past. Shake the "skeletons in the closet" if you have to! Remember: Once your elders are gone, a little bit of your family history and who YOU are, goes with them! This page gives a brief history on the possible origins of my family's name: "Collymore." Here I have gathered a number of photos from the various Collymores represented on the family tree. If you enjoy old family photos, you will want to look around here. Here, you will find a graphic display of the Collymore family tree. It currently covers eight generations (of which I am of the fourth). I would like to go back further, but unfortunately, in part because of the slave trade, I have no records beyond what you see here. If, though, you can find me documentation proving any earlier ancestors are part of this tree, I would be happy to add them and make an update. This section contains several articles that look at my father's contributions and tribulations during his life in White Plains, NY. Following that is an article published on Feb. 1st, 2000, "kicking-off" Black History Month. Here, he is recognized again but this article focuses on the risks & challenges he faced as a black man in a northeastern, American city in the 1930's. This includes the cross-burning on the lawn of his newly purchased house in an all-white neighborhood of White Plains, NY. I believe that we all need to be doing a LOT more than what most of us are doing to be good "stewards" of the Earth. For those of you who would like to know more about what you can do, this page is a jumping off point to a variety of other environmental group web sites. Take a look. Become inspired. Make a positive difference. On the Collymore Family Tree page, rather than scrolling all over your browser window to see parts of the tree, I've miniaturized it for an "at-a-glance" view. To see a magnified view, move your mouse over any part of the tree and you'll see an enlarged view on the right-hand side of the window. 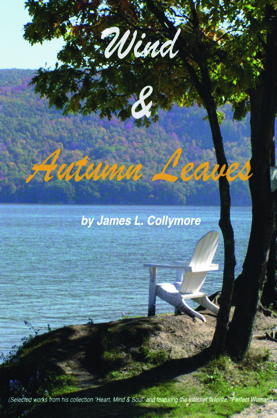 You can now purchase a paperback copy of my book of poetry, "Wind & Autumn Leaves" (which includes my well-known poem: "Perfect Woman") at the new lower price of $9.99 at Amazon.com and Lulu.com. If you'd prefer an e-book, it also has a new price of only $4.99! Please consider buying a copy for yourself, a friend, or a loved one. I greatly appreciate your support. Please note: Check the Lulu.com site occasionally. I will be offering discounts on the book. ** - Apple's eBook version requires that you use the free "iBook" app, available through iTunes, to download it and read it on an iPad, iPhone, or iPod Touch. If you have any questions, comments, or suggestions regarding this web site, or, if you would like to use any of its content for your online project, please send an e-mail to me at JLCollymore@comcast.net.